This is right inside the main entrance, behind the huge pylon. West has finished his discussions with us and we are on our way out. It was nearly noon by then and the place was mobbed. West also told us his theory on the symbolism for that last pillar on the right remaining unfinished but, for the life of me, I can't remember what he said. I think my brain was full. Remember how I mentioned that the number one had special significance to the ancient Egyptians? The number one literally represented 'The One', all there is in the universe, to them. The One which, at the creation of the universe, separated itself first into two aspects with the primordial scission. Two, to the ancients, did not mean two discrete pieces, because there is only 'The One'. It meant 'The One' separated into two aspects. One way to think of this is to visualize a still pond with its surface smooth as glass. If someone were to throw a small stone into the pond, the resulting ripples in that area, the disturbance if you will, would be the scission area in my example. Inside the main courtyard created by the first pylon and the second. Along with a few more people than when we got here. There is a modern word we use to describe the same concept that the ancients referred to when they referenced 'The One'. That word is infinity. Like 'The One', we can understand the idea of infinity, but not grasp the reality of it. When we try to grasp the reality of infinity, our brains overload. For example, try to grasp the reality of three million bytes of information that made up the raw version of the above picture. That's 24 million individual ones and zeros. (8 bits to a byte, times 3 million) I don't know about you, but my brain hurts at even the thought of having to look at 24 million ones and zeros spread out in a line. If trying to visualize 24 million ones and zeros hurts my head, imagine trying to visualize a infinite number of them. Infinity is, by definition, according to the old timers, beyond all comprehension. For those who have not been exposed to infinity math, infinity has very interesting properties. If we attempt to divide infinity by any number, say for example the number two. We get two infinite pieces. We can, in fact, divide infinity into an infinite number of pieces. But, each piece,of the infinite number of pieces, will still be infinitely large. (If that sounds crazy to you, please don't blame me. Someone a whole lot smarter than me figured this out.) Infinity added to, subtracted from, or multiplied by any number still results in infinity. 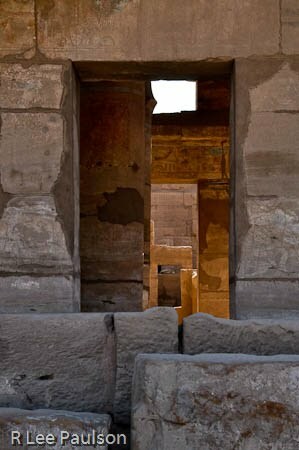 If we think of 'The One' as infinitely large, we come close to the ancient Egyptians' conception of it. 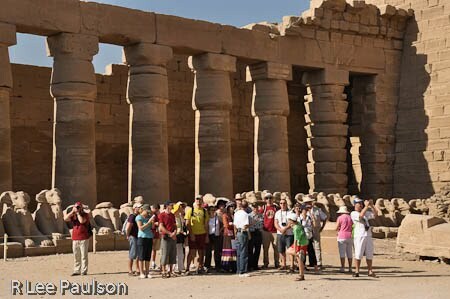 According to West, there is a deeper symbolism to the ceremonial act of moving the statue of Amun from this temple to the 'Temple of Man'. When Infinity, 'The One', All That Is, descends into matter, made from itself, of course, because there is only the one, and creates man, it must, by definition, leave a bit of itself there--in the man (or woman). It has to, because there is only the one, right? 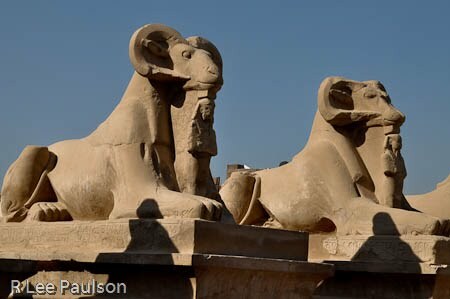 A close up, obviously, of the ram headed sphinxes. 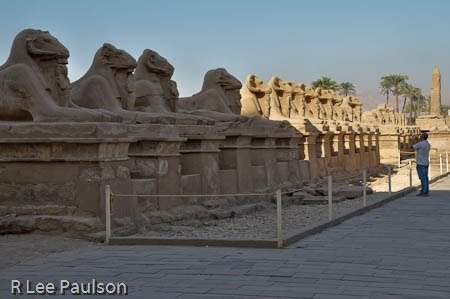 Supposedly, at one time, these sphinxes lined a boulevard that went roughly a mile and a quarter from this temple to the Luxor Temple, or the 'Temple of Man' as it is referred to by Schwaller de Lubicz. So, the deeper symbolism was an understanding that man, as an aspect of 'The One' not only has within him an infinite number of possibilities, but, by mathematical definition, is himself infinite, just like 'The One'. West claims that this could very well be what the ancient texts are referring to when they state that man was created in God's image. 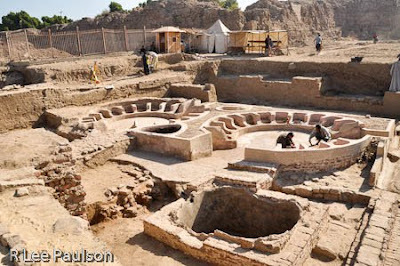 Right outside the main pylon Egyptian excavators have uncovered the remains of a Roman era bath. West knew the lead excavator, who was gracious enough to allow us a short tour of his site. Above we can see the two areas of seating. 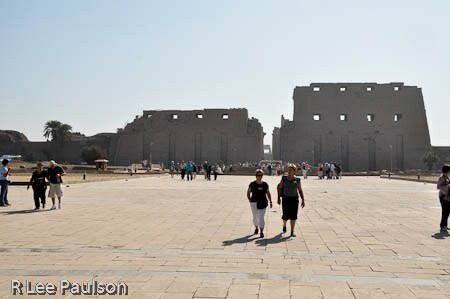 In the background you can still see the remnants of the huge mud brick wall that surrounded Karnak temple. The part that gets really crazy about this is that certain physicists claim that evidence has recently been discovered which more or less backs up the ancient Egyptian views of 'The One' discussed above. 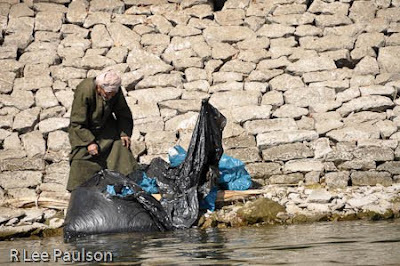 Other ancient religious traditions have also been teaching similar principles for millennia. 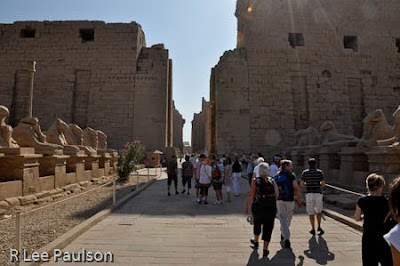 West claims this plaza outside the main pylon to Karnak Temple is has been newly installed. I couldn't get this shot earlier in the day when we arrived because it was too dark. (In truth, the light here isn't all that great, either.) The ruins in the photo above this are on the left of this paved walk way, just to the left of the little shack. 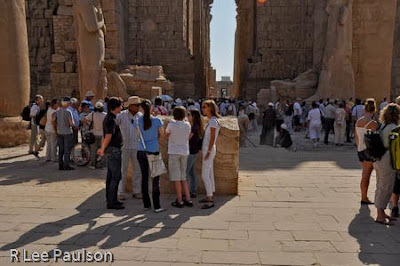 Of course, if one were to bring up any of the ideas mentioned here at a dinner party full of conventional Egypologists, that individual could easily get a martini dumped over his or her head. Still, the question remains about what the ancients actually knew and what they did not. From the temple, we walked a short distance down to the river, where our little taxi was waiting. For what it's worth, Laird Scranton, a friend of West's, (West, by the way, completely supports Scranton's conclusions.) has done quite a bit of research on this subject. He has two books out where he makes a solid case that whoever created the hieroglyphic system used by the ancient Egyptians knew and understood the ins and outs of astrophysics as we are beginning to understand it today. But the point is that, while there will always be more questions than answers when it comes to the subject of ancient Egypt, the bright side for those who hold alternative views to those of the mainstream academics is that an ever increasing amount of evidence is being uncovered to support that position. 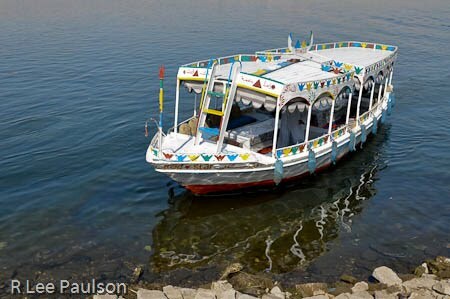 Next time, we go on a Nile River cruise. Continue on to Post 33: We go on a Nile River cruise by clicking here.